On really, really…really (! )…cold days like we have been having, I love to make something in the slow cooker. I love that I can smell the warm and cozy scents and flavors all day and look forward to cozying up with the perfectly cooked dish at night for dinner. 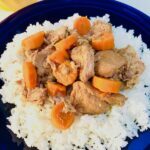 This Slow Cooker Pork Stew is so simple, yet so flavorful. It only has 5 ingredients (not including salt, pepper, water), so what could be better? 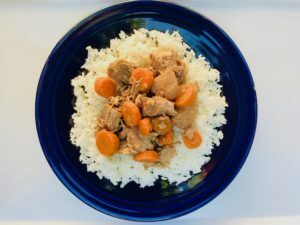 I love to use Pork stew meat that has already been cubed for me by the butcher because it cooks evenly and gets incredibly tender and is so easy to pull apart. This recipe uses 2 lbs of pork so that you have leftovers to enjoy over and over – or to entertain a larger group. This stew can be frozen to reheat at a later date or put in the fridge for eating the next day! 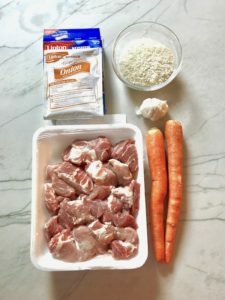 The simple ingredients in addition to the pork are Carrots, Onion Soup Mix (I am not an affiliate and I am not earning a commision from this soup mix, I just think it works great in this recipe), Garlic, and Rice. Everything (except the rice) gets tossed into the slow cooker with water and then simmers for 8 hours. Serve over rice and enjoy! 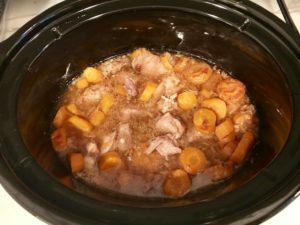 I hope you try this Slow Cooker Pork Stew and love it as much as I do! Please be sure to leave your comments! By the way, here is another pork recipe to use the leftovers in: Pork Carnitas Tacos: CLICK HERE. Peel and slice the carrots. Mince the garlic. 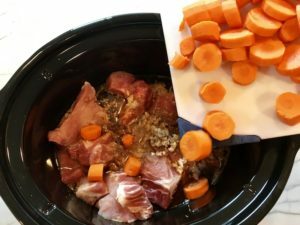 To the slow cooker pot, add the pork, the onion soup mix, garlic, and carrots. Fill with 1.5 cups water or enough to cover the pork. 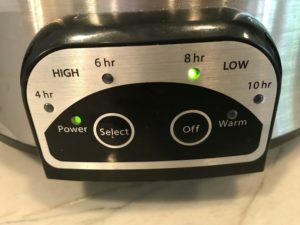 Set slow cooker to 8 hours. 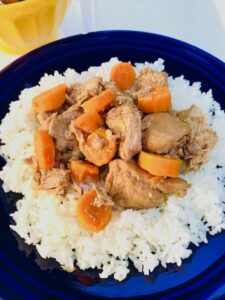 Next > Weekly Meal Plan: Slow Cooker Pork – 1 pot, 3 meals!